The Mid-Term SWU Price Indicator is TradeTech’s judgment of the base price at which transactions for mid-term or intermediate delivery of enrichment services could be concluded as of the last day of the month, for transactions in which the price at the time of delivery would be an escalation of the base price from a previous point in time. The Mid-Term SWU Price Indicator applies in cases where deliveries begin immediately beyond the 12-month spot delivery window and occur within three years from that point, as either standalone agreements or as part of long-term contracts. 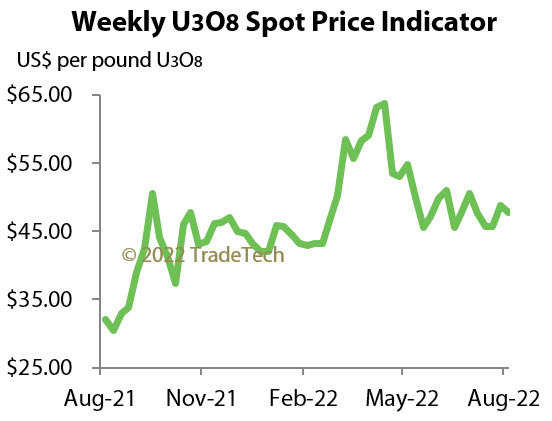 TradeTech’s Mid-Term SWU Price Indicator is determined as of the last day of the month and expressed in US Dollar per SWU.